You made India feel proud of you. You made India happy, for you strengthened her ‘can-do’ attitude; indeed, you gently nudged the country to move away from ‘can-do’ attitude to ‘will-do’ culture. And, what a journey! Having been injected into the elliptical orbit around earth by—a not-too-sophisticated launch vehicle—PSLV-XL rocket on November 5, 2013 from Sriharikota space station, escaping earth’s gravity aided by six orbit-raising manoeuvres conducted by the ground control station and entering Sun-centric path towards Mars, and travelling a mind-boggling distance of 680 million km, all on its own—correcting altitude with the aid of star-gazer to look at the constellations every microsecond and comparing with the preloaded patterns and positioning its antenna constantly toward Earth for communication with ground control station while keeping its solar panels toward the sun to generate power as per the stored commands in its electronic brain—arrives the Mars Orbiter after 300 days of odyssey within a circle of less than two kilometers from Mars at the appointed time.... Finally on the D-day—September 24, 2014—as the hibernating Newton engine is restarted by the mission control after 300 days at 07:17:32, the control room gets confirmation about start of the eclipse at 07:21:50 ending at 07:37:01; in the meanwhile, liquid engine burn ends at 07:41:46, and reverse manoeuvre having started at 07:42 ends at 07:52:46, placing the spacecraft finally into Mars orbit; and as the confirmation is received by ground station at 08:04:32 (due to the time taken by the telemetry), the whole hall that was till then passing through nerve-wracking moments, at once leaps into air, clapping the success of the mission. India has thus emerged as the first nation to reach the Mars orbit at the very first attempt. And, all this at a nominal cost of Rs 450 crores—a mere one-fifth of the money spent by the US/ European space agencies on such missions. And the takeaway is: it has simply boosted the national spirit. And it makes us believe in our strength. The world will look at India as a capable country to deliver space-related services. It simply puts India and Indians in a new trajectory—a trajectory of confidence—which is sure to push India towards growth in its science and technology and its application for the overall emancipation of its population. It gives unquantifiable courage, besides formidable image in the global market to all those agencies which have developed, fabricated and supplied various inputs to the mission—both from the private and public enterprises—to undertake newer assignments however clouded they might be in uncertainty and execute them successfully. What else you expect from the Tax-payers' money spent! 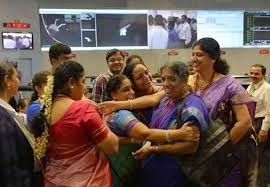 Jai Ho, ISRO, India and Indian scientists!